Due to the large, and increasing, number of cyber threats and issues in today's world, securing your internet activities, business knowledge and sensitive information has become one of the most important topics and issues of today. In fact, in our latest CEO Outlook report, we found out that Cyber Security is what keep most CEOs awake at night. As such, KPMG's Cyber division offers you long-term partnerships in order to help protect you from possible hacks and breaches, as well as fix any tampering that has occurred within your business information and tools. Currently we do this by using three steps: Find it, Fix it, Manage it. In a global environment defined by constant disruption, business leaders need to be confident in their decisions. And that means being confident in their data, their algorithms and their analytics capabilities. KPMG's network of Data & Analytics professionals recognises that analytics has the power to create great value. That is why they take a business-first perspective, helping solve complex business challenges using analytics that clients can trust. Data & Analytics professionals focus on solving complex business issues across all the key drivers of organisational value, including growth, risk and performance - to deliver an unwavering commitment to precision and quality in everything they do. Regulatory change is the biggest issue that you could be grappling with. Scrutiny is intensifying from multiple stakeholders including regulators, investors, counterparties, and other market participants in a post-crisis environment where compliance demands are now far more intensive and detailed than ever before. 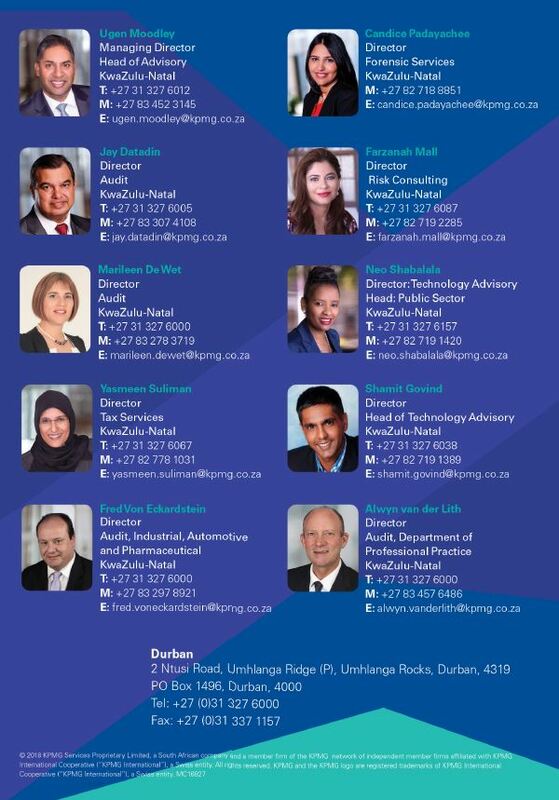 Having a Centre of Excellence at KPMG enables us to pull together multi-disciplinary experts as you need them. We are, simply, your 'one-stop-shop' for regulatory change. We are currently Level 2 rated and we continue to be totally committed to transformation. In order to improve our rating by the end of the current financial year, increased focus will be placed on redirecting our skills development and procurement spend. We will also ensure that we have a sustainable approach to improving the ownership and management control elements of our business in order to realise improved and responsible transformation as well as stronger scorecard performance. Corporate citizenship is embedded in the KPMG values and we recognise that our firm has the scale, influence and business knowledge to make a significant and positive contribution to the issues that affect our communities and environments. By giving back to the communities in which we serve, through funds, time and our skills, KPMG aims to make a real and sustainable difference with substantial positive impact. With passion and purpose, we work shoulder to shoulder with our clients, integrating innovative approaches and deep expertise to deliver real results. 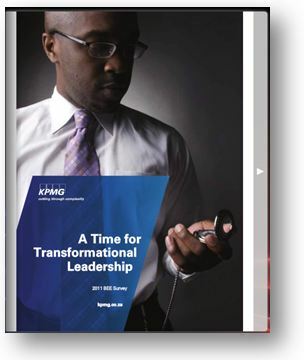 Nature of Business: KPMG is a global network of professional firms providing Audit, Tax and Advisory services. We operate in 152 countries and have 189,000 people working in member firms around the world. The independent member firms of the KPMG network are affiliated with KPMG International Cooperative ("KPMG International"), a Swiss entity. 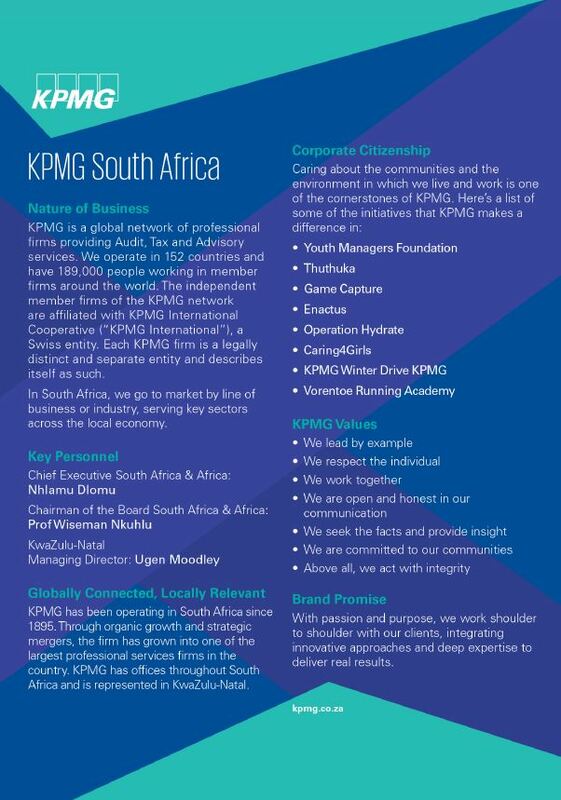 Each KPMG firm is a legally distinct and separate entity and describes itself as such. In South Africa, we go to market by line of business or industry, serving key sectors across the local economy. Our priority sectors include: Financial Services, Mining, Oil and Gas, Consumer Markets, Technology, Telecommunications, Construction, Industrial and Automotive, Government, Infrastructure and Public Sector, and Private Equity. Brett Franklin:KPMG - Electronic Data And Litigation : Are You Ready? Yasmeen Suliman : KPMG Durban - Tax Hikes - A Foregone Conclusion?